My friend Doree Shafrir wrote the book on moms. Mom emails specifically. Her popular book Love Mom (with the brills Jessica Grose) and blog Postcards from Yo Momma is the seminal reference guide to emailing with mom. Here's how it's done. hey, women wore gloves! everyone did. i had several pairs of gloves, bought separately.don't you remember that philip roth novel? i had my hair done. 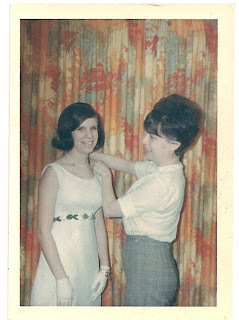 maybe it was for my high school sorority dance......or prom since nana was in shorts. i remember that i got the dress that was long and had the dressmaker make it short. i LOVED that dress. i want to say filene's (upstairs). i was class treasurer. i went with jimmy schaye. martha starr fixed me up since he went to private school. his father owned a department store in boston. tres riche but i didn't go out with him before or after that. Thanks Mrs. Shafrir! Not only am I a fan of the ballroom dancing gloves. I also love your 60's hair curl. I don't care what private school he went to, that Jimmy Shaye is one lucky guy. I love that dress too, and the hair flip? Awesome.